All four parts of the UK continue to have a lively debate about the right way to fund the education of undergraduates. In England, for example, the promises about free tuition made by Jeremy Corbyn and John McDonnell at the 2017 General Election helped ensure the Conservatives stuck to their manifesto commitment to set up a review of tertiary education. In these debates, people typically recommend looking at other countries. There is a particular focus on Germany, as those German states that had tuition fees abolished them. As HEPI has pointed out repeatedly, it is possible to run good-quality fee-free systems as in Germany, not to mention Scotland. But there are inevitable trade-offs, most notably in terms of the number of places and / or the amount of money available to spend on each student’s education. This is proven by new analysis of the recent experience in another, often overlooked, country. Chile had among the highest fees in the world (relative to its wealth), but widespread protests led to an official commitment to abolish fees. The end result, as explained in detail in this detailed and fresh account (republished with permission from the Brookings Institution website), has not – yet at least – lived up to expectations. In short, the policy has not been universal, has left universities underfunded and appears to be crowding out many of the very people from low-income families it was meant to help. Supporters of free college proposals in the US often look to Europe for case studies, but Chile may actually provide a better comparative study. Tuition-free higher education emerged in Chile as a popular idea in the wake of the massive student protests in 2011 in response to what students argued was unaffordable tuition, high student debt, and large concentration of enrollments in private higher education institutions. Chilean lawmakers ultimately adopted a tuition-free policy in 2016, or ‘gratuidad’ in Spanish. This policy is not as sweeping as it may seem. Policymakers included a number of features to limit its cost and scope. Not all colleges and universities are eligible to participate and others opted not to; the benefit is restricted to students with low and middle incomes; and many students eligible for gratuidad already had access to generous amounts of government-issued grants and scholarships. Notably, more low-income students gained access to government aid under gratuidad because the program does not require students to meet a test-score cutoff, unlike the system of grants and loans it partially replaced. Public universities, which must offer free tuition under gratuidad, argue that government appropriations are not sufficient to make up for the lost tuition revenue and cover the costs of educating students. Empirical evidence suggests that absent a large increase in capacity at Chilean universities, gratuidad is likely to crowd out low-income students. In the US, free college policies emerged as a major theme during the 2016 presidential election. Two Democratic candidates, Senator Bernie Sanders and Secretary Hillary Clinton, each proposed plans to make college free at public universities with federal matching grants. While the election results dashed those specific proposals, the idea continues to appeal to many policymakers as a way of addressing rising college prices, growing student debt burdens, and unequal access to higher education institutions. Recently, tuition-free policies have seen some movement in state legislatures. In 2017, New York lawmakers implemented a free college program, the Excelsior scholarship, for students from families earning up to $125,000 a year who attend in-state public institutions. In 2011, Chilean students staged massive protests against the country’s education policies that they criticized as overly reliant on free-market principles – mainly that higher education institutions charged relatively high tuition and many students borrowed to finance their education. Indeed, Chile has historically required students and families to pay a relatively large share of higher education costs. Like the US, however, students from lower-income families receive scholarships to defray tuition prices. The similarities with the US go even further. A central part of Michelle Bachelet’s 2013 presidential campaign was a pledge to make higher education tuition-free (‘gratuidad’, in Spanish) for all students from families in the lower 70 percent of the income distribution by 2018, and tuition-free for all students regardless of income by 2020. President Bachelet won the election based partly on that proposal. Given the similarities between Chile and the US in the cost and structure of their higher education systems, and the political pressures that made free college a national issue, examining Chile’s experience with gratuidad is likely to be informative for US audiences. This paper will outline the details of Chile’s gratuidad program and the system it replaced. It then discusses some of the changes and unintended consequences observed in the wake of the reform, and links these points to the debate over free college in the US. The Chilean higher education system has a similar organization to that in the US. There is a mix of public and private universities (18 public, 44 private), numerous private professional institutes (most of them for-profit) and private technical training centers (almost all for-profit). Chile’s universities also range in quality and selectivity. One key difference with the US is that 85 percent of Chilean students are enrolled in private institutions. 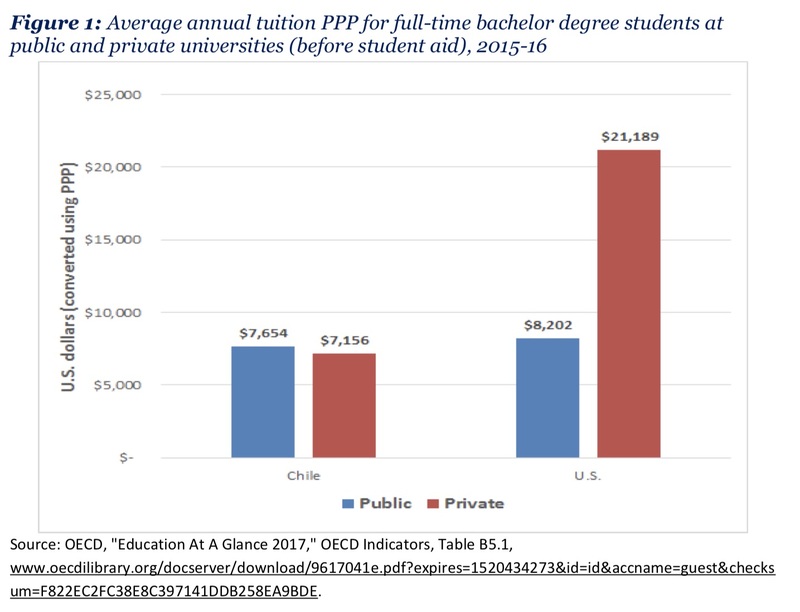 Tuition in Chile is among the highest in the world, about $7,600 (purchasing power parity) on average at public universities (see Figure 1). However, this price does not factor in government grant and scholarship aid, which can significantly reduce the net price that students pay. The average tuition – the sticker price that universities advertise – is equivalent to approximately half of median family income. Only American private universities and British [English] universities have higher sticker prices relative to per capita gross national product. Another similarity with the US system is that many students do not pay the sticker price that universities publish. Discounts offered at the university level in the form of scholarships, together with government-funded student aid, cover most or all fees for students with low- and middle-incomes. The average scholarship for low-income students covers between 63 and 70 percent of actual tuition costs. Government-backed student loans are also available, which allow students to borrow for almost the entire cost of tuition (but are not available for cost-of-living expenses) and feature below-market interest rates, income-based repayment terms, and loan forgiveness after a certain number of payments. The loans and scholarships are generally available to students from the lowest four income quintiles, with most scholarships limited to students from the lowest two quintiles. Overall, about half of all undergraduate students in Chile received financial aid in the form of scholarships or loans before gratuidad was introduced in 2016. The scholarship and loan programs include merit requirements. To qualify for the aid, students must achieve a minimum score on a national college-admission test, the PSU [Prueba de Selección Universitaria], similar to the SAT or ACT in the US. The cutoff for eligibility differs by program, but typically falls around median test scores for all test takers. That is a sharp break with the US where federal grants and loans are provided without regard to test scores or grades, although some programs offered by states and universities often include a merit requirement. In 2011, Chilean students staged massive demonstrations against the government’s higher education policies. They complained that the government had abandoned public higher education in favor of market-based policies. This ‘marketization’ was, in their view, producing a ‘commodified’ education that relied on expensive tuition and high student debt, profiteering, and concentration of enrollments in the private sector. The student movement advocated for several reforms. Primarily, they called for greater access to higher education, especially for lower-income families. (As of 2011, the gross enrollment rate was 27 percent for students in the bottom income decile, and 91 percent for those in the top decile.) This, they argued, could be achieved by abolishing tuition, first for students in the lower 70 percent of family income, and then to all students. They also demanded more capacity at public universities. This was not the first organized student movement regarding higher education costs. Equally large demonstrations occurred in 2006, although students did not call for free tuition. Policymakers assuaged these past complaints by expanding existing aid programs. For example, in 2011, President Piñera greatly expanded scholarships and increased loan benefits by adopting an income-contingent repayment design and cutting interest rates to 2 percent. These concessions were not sufficient, however, as this time students rallied around the idea of free tuition as the antidote to market-based policies. In the 2013 presidential campaign, free college became a central pledge of Michelle Bachelet, the Socialist Party candidate, along with tax reform to finance it. As the student protests had demanded, the first stage of the proposal would apply to all students in the lowest 70 percent of family income by 2018, and would eventually apply to students regardless of family income by 2020. Michelle Bachelet was elected with 62 percent of the vote in 2013, and won comfortable majorities for her coalition in both houses of Congress. This provided her with a clear mandate to enact gratuidad. But the promise to provide free college to all students quickly proved challenging. The Ministry of Finance calculated free tuition for all students would cost 2.1 trillion Chilean pesos, or $3.14 billion per year, an amount deemed unattainable given the level of economic growth and tax revenue at the time. Following Bachelet’s election, economic growth slowed to its lowest level in years due largely to the sudden drop in the price of copper, which is a significant source of Chilean tax revenues. There simply was not enough revenue to make good on the promise of free tuition – at least initially. Faced with reconciling the high cost of gratuidad and lower-than-expected government revenues, the Bachelet government opted to pare the plan down and phase it in more gradually – a move that ultimately allowed her government to enact the policy starting in 2016. This version cost 518 billion Chilean pesos, or roughly $810 million, a fraction of the cost of her initial campaign pledge. In 2016, its initial year, gratuidad applied only to students in the lower 50 percent of the income distribution, not the lower 70 percent as first proposed. In its third year, 2018, the program would expand to include students in the lower 60 percent of the family income distribution. Lawmakers enacted the program to automatically extend to additional students once tax revenues reach specified thresholds. Under the current policy, students eligible for free tuition include both current and newly enrolled undergraduates at eligible institutions. All public universities are required to adhere to gratuidad, meaning they must agree to waive tuition for students they admit who meet the family income qualifications. Private universities and colleges can opt to participate in gratuidad if they are structured as non-profits and meet higher levels of accreditation status. Universities and colleges receive per-student subsidies from the government, the amount of which is determined by a formula, to offset the cost of enrolling students eligible for gratuidad (discussed more in a subsequent section). Students enrolled at non-participating institutions, or those enrolled in participating institutions who are above the income threshold for gratuidad, can still apply for government scholarships and receive a government-backed subsidized loan. Professional institutes and technical training centers were excluded from gratuidad at first, but lawmakers offered assurances that they would be included in the 2017-2018 school year, which the government eventually followed through on. However, these institutions must meet minimum accreditation requirements and be organized as non-profits (or formally commit to transform into non-profit entities during 2017). At the time the policy was enacted, most were organized as for-profit entities. There is another limitation on the benefits of gratuidad that helps limit costs. Students may qualify for free tuition only for the official duration of an educational program. In practice, however, time to degree typically runs 10 to 30 percent longer than the official duration of a program depending. For shorter-term programs, such as associate’s degrees, time to degree is typically 50 percent longer than official length. It is difficult to assess the impact of gratuidad because it has been in place for just two years. More data on enrollment levels, borrowing, and completion rates are needed before researchers can make definitive judgements on the success or shortfalls of the program. However, the available information from gratuidad’s first two years provides some sense of whether the policy is on track to produce its intended results. In that regard, this section covers four topics: University participation in gratuidad and enrollment changes observed in its initial years; the extent to which gratuidad replaced existing financial aid; an econometric study that suggests low-income students will be crowded out of more selective universities; and finally, the revenue pressures the program has imposed on universities and how that may threaten quality. As additional years of data become available, policymakers will be able to better judge the long-term impacts of gratuidad on college access and attainment. Student protesters and President Bachelet made the case for gratuidad partly on philosophical and ethical grounds – that higher education should be free because it is a right. Descriptive statistics, however, show that the policy falls far short of delivering universal free higher education. One factor is that not all universities participate in gratuidad. In 2016, the first year of gratuidad, only 30 universities out of the 60 operating in Chile participated in the program. Some institutions do not meet the accreditation requirements, but at least three eligible private universities opted not to participate. These universities have high tuition rates, campuses in the more affluent suburbs of Santiago, and larger shares of students from wealthier families. Gratuidad’s tuition caps would have had a significant financial impact on these institutions’ budgets. Even if all institutions participated in the program, gratuidad would not be a universal benefit so long as it is restricted to students from the lower half of the income distribution. The income cutoff, combined with the fact that many institutions are not eligible for the program due to their for-profit status or lower accreditation, or simply opt not to participate, make gratuidad’s reach quite minor. The program applied to just 12 percent of undergraduate students in 2016, or approximately 140,000 students. About one third of students who received the benefit that year were first-year students and the rest had been enrolled the prior year. Expanding the program beyond universities has improved the reach of the policy. As of the end of May 2017, it covered 22 percent of total undergraduate enrollments. Professional institutes and technical training centers, participating in the program for the first time in 2017, accounted for 36 percent of the beneficiaries, while universities accounted for the rest. Despite the limited reach of the program, the Ministry of Education suggests that it has been successful in allowing more students to enroll in higher education. By the Ministry’s estimates, 15 percent of entrants in 2016 would not have enrolled under the pre-existing financial aid scheme of grants, scholarships, and loans. There is another dynamic that will likely limit gratuidad’s ability to bring about major enrollment changes. According to the Ministry of Education, 87 percent of non-first-year students who received gratuidad in 2016 had some form of government-issued financial aid in 2015, meaning just 13 percent had no prior assistance. That is because students from families in the lower 50 percent of the income distribution qualify for scholarships and loans. To be sure, some of these students received subsidized loans that they may have needed to fully repay, or grants and scholarships that only partially covered tuition. In that regard, gratuidad did increase aid. In the years before gratuidad, the OECD and the World Bank estimate that average scholarship award for low-income students covered between 63 and 70 percent of the actual cost of tuition fees. For the rest of the costs, students either had to pay out of pocket or take out subsidized loans. This underscores that gratuidad has mostly supplanted existing forms of student aid. However, students who had been ineligible for scholarships prior to gratuidad because they did not meet the academic requirements gained significant amounts of aid. Gratuidad does not include any merit requirements. There are no academic performance standards beyond the criteria set by the university itself for admission. Given that some participating universities have admissions standards below those required by the loan and scholarship programs, the students opting to attend those institutions benefited most from gratuidad. There is some support for this argument in the data. The three institutions that enrolled the most gratuidad students in 2016 are the least selective of the 30 participating universities, and most of their students would not have had access to other forms of financial aid because they would not have met the academic standards. This suggests that the government might have increased enrollment among lower-income students just as much if it had simply removed the academic requirements on its existing scholarship programs instead of adopting gratuidad. Advocates for gratuidad argued that free tuition and the removal of merit requirements for government-issued financial aid would allow more low-income students to enroll. While the Ministry of Education purports that access has increased, an independent study suggests that the policy risks producing the opposite effect for low-income students. An empirical study by Alonso Bucarey of MIT uses enrollment changes observed after earlier financial aid reforms in Chile to predict that gratuidad will reduce enrollment among low-income students and push those who do enroll into lower quality institutions. This is consistent with studies on free tuition policies in other countries, where wealthier students receive the largest share of the benefits and low-income students see minimal enrollment gains. A 2017 paper by Richard Murphy, Judith Scott-Clayton, and Gillian Wyness documents these trends in an analysis of tuition policies and college enrollment in England. The Bucarey study uses administrative records from the Ministry of Education and suggests that expanding scholarship eligibility to students from families with middle-class incomes in 2012 (four years prior to gratuidad) caused universities to become more selective and admit students with higher test scores. Lower-income students tend to have lower scores and were thus crowded out of more selective universities that they would have been admitted to before the expansion in scholarship aid. Those slots went to middle-income students who were newly eligible for aid and also tended to have higher scores. Bucarey uses this data to predict how large such an effect might be when gratuidad is fully phased in to cover all students regardless of family income. He finds that Chile should expect a 20 percent decline in the number of low-income students that enroll in universities relative to the number enrolled before gratuidad, as upper income students crowd them out of the admissions process. He explains that this effect could be mitigated by a large expansion in the capacity of Chile’s universities. Ironically, gratuidad makes it difficult – if not impossible – for universities to expand capacity, let alone maintain their existing operations. We discuss this issue below. Under gratuidad, the government pays tuition on behalf of each eligible student an institution enrolls. But this amount is insufficient to cover the actual cost the universities incur for every ‘free’ student. The government uses a formula to determine payments to institutions to determine a per-student funding allocation (called ‘regulated tuition’). The formula divides institutions into categories according to the length of their accreditation term (a proxy for quality) and then sets the regulated tuition for each group and each study program. Regulated tuition – and the funding allocation – is equal to the average of the tuition fees that the group of universities charged before gratuidad, plus a maximum 20 percent bonus for those with actual tuition fees that are higher than this regulated value. This funding mechanism will likely inhibit universities from expanding capacity if they conclude that the funding formula is insufficient for financing such an expansion. Even if universities find economies of scale in enrolling more students, a provision under gratuidad that caps enrollment growth at 2.7 percent annually is likely to limit that strategy. There is also a risk that gratuidad’s funding formula will diminish educational quality at universities. For institutions with the highest tuitions fees, the formula results in a net loss in revenue compared with what they could earn previously, when students had to pay for the difference between tuition charges and government-issued student aid. This problem will hit the most expensive universities – usually the most selective and prestigious – the hardest. Under gratuidad they will not receive full funding from the government for students on the free track and will have to generate the missing revenue elsewhere, or cut spending. The rectors of some of these universities are calling attention to the funding squeeze and its consequences. The rollout of free college in Chile offers a number of lessons for U.S. policymakers. The country may be pursuing the ideal of free college, but so far the practical effect has been more circumscribed and presents unintended consequences. Instead of universal free college, gratuidad can best be described as having replaced a system of targeted financial aid and cost sharing (ie tuition) with a system that has slightly less targeted aid and moderately less cost sharing. The incremental change in student aid for low-income students who received scholarships and heavily subsidized loans prior to gratuidad is arguably small, and upper-income students still must pay tuition. Perhaps the most significant change is that gratuidad does not include academic restrictions, which allows more low-income students to benefit from government aid. But such a policy could easily be implemented through a system of means-tested grants and tuition discounts, like the current US system, without providing costly tuition benefits to students who can afford to pay at least part of their higher education expenses. On the other hand, targeted benefits can be opaque such that students may not know they are eligible, leading them to erroneously conclude that college is financially out of reach. A free-college policy like gratuidad has the potential to alleviate that problem because it is easier for a student to understand, but it is too early to know if gratuidad is having that effect. US audiences should pay close attention to whether gratuidad encourages more low-income students to enroll as it is one of the main arguments free-college proponents in the US make for replacing targeted aid. Moreover, the system in Chile that gratuidad replaced shares many features with the current US model, suggesting that providing free college in the US, either at the state level or through federal-state matching funds, could have similar effects as in Chile. Like in Chile before gratuidad, the US uses a differentiated pricing scheme in its higher education system that provides a substantial amount of aid to low-income students, moderate amounts to middle-income students, but requires upper-income students to pay nearly the full price of tuition. For example, 64 percent of full-time students from families earning less than $30,000 that attend in-state public universities pay no tuition after factoring in all sources of student aid (excluding student loans as aid). The institutions these students attend charge a median in-state sticker price of $6,035 per year, and most low-income students receive enough in discounts, grants, and tax benefits to fully offset that tuition. Even middle-income students attending these institutions are spared full price. Their median net tuition is $1,696 after discounts, grants, and tax benefits are included, but the institutions they attend charge a median in-state, full-time sticker price of $6,840. It is students from upper-middle and high-income families who typically pay full tuition. These statistics suggest that many low-income students would not see large changes in the tuition they pay under a free-college policy, while other students would see more significant changes. Indeed, a 2016 analysis by Matt Chingos shows that the benefits of free college in the US would skew toward middle and upper-income families. However, because most free college proposals in the US include an income cutoff around $125,000 for upper-income students, free college would not apply to these students, as is the case in Chile. US policymakers should also be wary of the unintended consequences emerging as a result of gratuidad. Low-income student enrollment in US institutions could decline if free college proposals led to the type of crowding out predicted to occur in Chile’s system. Even if the US can avoid the regressive effects of free tuition seen in other countries, the policy may still diminish educational quality. Prohibiting institutions from charging tuition or capping how much they may charge can threaten quality if public funding does not keep pace with rising costs, which is a concern that rarely comes up in US debates about free college. As the case of Chile shows, the country’s most prestigious universities, which have the highest cost structures, now face budget deficits because of gratuidad. They will likely have to cut spending to make up for declining revenue. In the US higher education system, higher spending by institutions is often associated with greater quality, and research also shows that higher spending leads to more degree attainment, particularly at less selective institutions. Researchers will be able to evaluate the full effects of gratuidad in the coming years as more data become available. It may turn out that the reform markedly boosts access and degree attainment. As it stands now, however, the substantial increase in spending and only modest reduction in Chile’s tuition prices for students eligible for gratuidad underscore the benefits of targeting financial aid at certain students. Targeted financial aid, like in the US and Chile before gratuidad, can be more progressive than universal free college and can provide more flexibility and essential revenue for universities. The gratuidad experiment tests this theory. While US advocates like to point to a few remaining examples of countries that provide free tuition, the reality is that many countries have actually moved away from free college and toward a system of cost-sharing with students. These models appear to strike the right balance among the many tradeoffs – price, access, and quality – that affect the success of a country’s higher education system. If gratuidad in Chile proves fiscally sustainable, increases access, and mitigates unintended consequences, it will be a notable exception to the case for greater cost sharing in higher education. A pdf version of this article, including extensive references is available at https://www.brookings.edu/wp-content/uploads/2018/03/delisle-and-bernasconi-report.pdf. ← If student numbers are set to grow, then isn’t it about time we ensure we will have the staff to teach them?